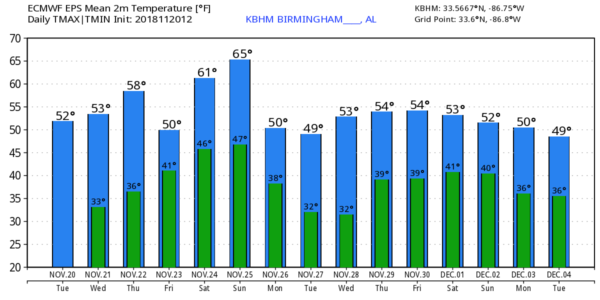 SUNNY, COOL AFTERNOON: The average high for Nov. 20 at Birmingham is 64; temperatures today are only in the 40s and 50s over the northern half of the state despite sunshine in full supply. Tonight will be clear and cold; we project a low between 28 and 34 degrees for most of the state early Wednesday morning. WEDNESDAY/THANKSGIVING: Sunny, cool weather continues Wednesday with a high in the 50s for north Alabama and 60s for the southern counties of the state. Our weather stays dry on Thursday with a good supply of sunshine. We start the day in the 30s; the high will be in the low 60s for north and central Alabama, with mid to upper 60s for the southern part of the state — a very nice Thanksgiving Day. FRIDAY AND THE WEEKEND: Clouds will increase during the day Friday, and rain will move into Alabama Friday night. Some thunder is possible, but we don’t expect any severe weather. Rain amounts of one-half inch to 1 inch are likely, and the main window for rain will come from 7 p.m. Friday through 7 a.m. Saturday. The rest of the day Saturday will be mostly cloudy and mild; we could see a few peeks of sun by afternoon. The high will be in the 66- to 70-degree range. Then, on Sunday, we will mention a chance of showers and storms with a passing cold front during the afternoon and evening. This system on Sunday will be pretty vigorous, but with limited moisture and instability, for now the threat of severe storms looks low. We will keep a close eye on the system as the weekend gets closer. The high Sunday will be in the upper 60s. FOOTBALL WEATHER: For the high school playoff games Friday night, rain is likely with temperatures in the 50s. Then, for the Iron Bowl Saturday in Tuscaloosa (Auburn at Alabama, 2:30 p.m. kickoff), the sky will be mostly cloudy, but the weather looks dry. Temperatures will be in the upper 60s at kickoff, falling back into the low 60s by the final whistle. A very comfortable Saturday afternoon for late November. UAB plays at Middle Tennessee State Saturday (2 p.m. kickoff in Murfreesboro). The sky will be mostly cloudy, but no rain is expected. Temperatures will be in the mid 60s at kickoff, falling into the upper 50s by the second half. NEXT WEEK: Monday will be breezy and cooler with gradual clearing, followed by dry and very cool weather Tuesday and Wednesday. Rain and storms should return late in the week. ON THIS DATE IN 1900: A tornado struck the town of Columbia, in Maury County, Tennessee, at approximately 9:30 p.m. A very destructive and devastating path was cut through the northwestern parts of town, with the most damage occurring in the Macedonia community. This twister ended up being rated an F4 and was on the ground for a total of 8 miles. The damage path at its widest was 300 yards, littered with pieces of homes and cabins. Twenty-seven people lost their lives, and another 75 were injured.